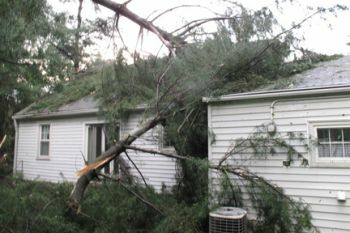 Whether it’s a hail storm, snow storm or even a thunderstorm causing a tree to lose one of its heavy branches, you may, at some point, need to file an insurance claim to have your roof repaired or replaced. Here are some helpful tips to help you through the often confusing task of filing an insurance claim for your damaged roof. When your area experiences a hailstorm or other severe weather condition, the first thing you need to do is to inspect your home and property for damage. It’s important to inspect your roof at this time, unlike other parts of your home, your roof can sustain damage that will only be apparent at a later date, when it starts to leak. When this happens, it will be too late to file a claim, and installing a new roof yourself can be expensive, and it’s a home investment with one of the lowest returns. It’s important to contact a professional roofing contractor to inspect your home’s roof and see whether damage has occurred. This is recommended because the damage can be barely noticeable when it first occurs. The contractor will give you a rough estimate as to how much it will cost to fix your roof. Knowing the cost of the repairs in comparison to the amount of your deductible is very important. Insurance companies tend to raise a homeowner’s premium after claims are filed. This is why experts suggest not filing a claim unless the cost of repair is three times as much as the deductible. For example, if your deductible is $500, you shouldn’t file a claim if the repair costs are less than $1,500. In this case, it’s more affordable, in the long run, to pay for the repairs out of pocket instead of having your insurance company raise your premium. Read over your insurance policy to find out if the cause of your roof damage is covered. You may not be covered for certain situations, which will then have to be paid out of your pocket. If you are covered for the damage, contact your insurance agent, who will send an insurance adjuster to visit your home and inspect your roof. It may be in your best interest to hire an independent public adjuster to evaluate your claim as well. An adjuster from your insurance company will look for ways to minimize your claim, where a public adjuster will not, since they are paid a percentage of the settlement. Usually the insurance adjuster will want to be in touch with the roofing contractor to make sure that they agree about the extent of the damages and the cost of repair. In the event you need your roof repaired or replaced, it pays to have a complete understanding of your homeowner’s insurance policy before you make any decisions. Understand your coverage and what it means to you.